Many of you will know that coriander is my favourite herb I like everything about it, how it smells, looks and tastes. I would be growing t if I could, but somehow its the one herb that I have failed to grow from seed, whereas my mother never has a problem. Anyway, a couple of weeks back, I came across what I thought was a bargain offer 2 big fresh bunches of coriander for £1.50, well I just had to get me some. But once I got it home heavily scented by the coriander waft, the question was what to do with it. Sometimes, I will just wash it, chop it and freeze so that I can add it to dishes at the end for an additional flavour burst, but I wanted to make more of, yes more of a meal of it. So for a change from a tomato based sauce dish, I decided on making this Hara Masala aka Green Sauce with coriander with vegan meatballs. It was delish, but I will say that I like coriander. I snook in some coriander into vegetarian sausage meat that were transformed into bite size 'meatballs'. 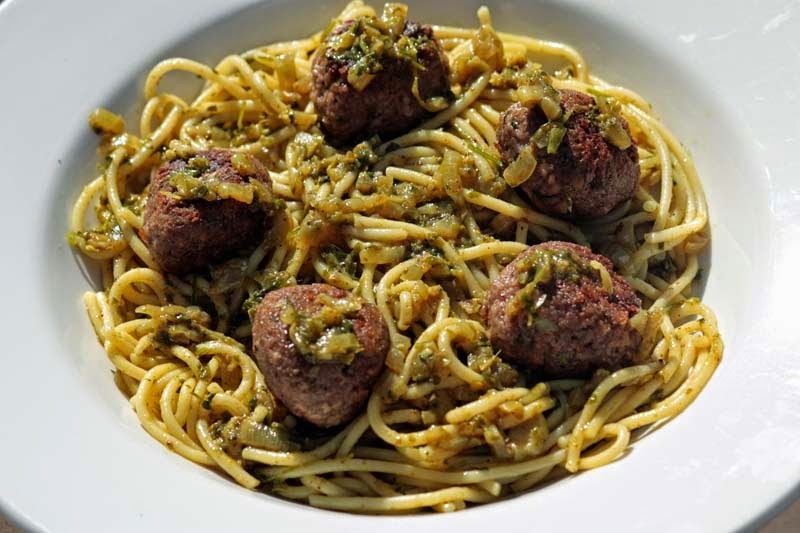 When cooked, all golden and warm - the spices and coriander flecked vegan meatballs added texture and substance, and the green sauce clung beautifully to the spaghetti pasta. The vegan Meatballs in Hara Masala can be served with plain Basmati rice, but D expressed that he was getting a bit tired of eating rice as we had rice at least three times that particular week, so I stirred spaghetti pasta into the sauce instead. It was actually okay, a bit like Spaghetti Bolognese but lighter and greener. In a large bowl, stir in Sausage mix minced spring onions, chillies and the masala. Then carefully pour in 300ml cold water, stir well to combine and then let it sit for 30 minutes to thicken. After about 30 minutes, the sausage mix should be thick, with you hands scoop out around a large tablespoon and roll into small round balls, keep doing this until you have used up all the mock sausage meat, keeping in mind that this will be divided between 3 - 4 people. When done, heat a couple of tablespoons of olive oil in a large frying pan and pan fry them, ensuring all sides are golden and done. Drain and set aside, feel free to put in the oven to stay warm if you wish. Put all the ingredients except for the oil in a blender and blitz to a smooth paste. In a wide pan, heat the oil, then tip in all the contents from the blender and cook for about 5 minutes, then pour in 1 pint of water and bring to the boil, when the sauce is simmering, turn the heat down and cook for 20 - 25 minutes or until the sauce begins to thicken and the oil begins to come to the surface. Taste and adjust seasoning if necessary. While the sauce is simmering, cook the pasta according to packet instructions, when ready drain and set aside. Argh! I think I would die if I ate all that coriander. I am very allergic to it. I think I would use Parsley for the green colour and just add garam masala for the spice if necessary. I know, I think of you every time I make a dish with coriander on my blog, and yes, parsley would work well here. I eat meat but am looking for ways to reduce it in my diet. 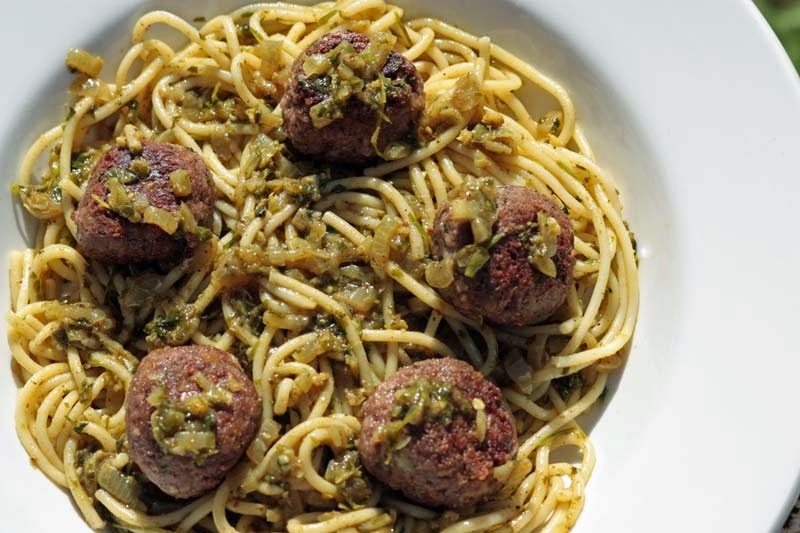 These meatless meatballs may help! Thank you, I will be making these meatballs again, but the sauce may differ. Thank you. You have a good weekend.